5 - 4..........Chico von Forell. 5 - 5..........Kira vom Romberg. 1989: 90-97-90 = 277 points (14th). 1988: 98-98-94 = 290 points (3rd). 1987: 90-80-91 = 261 points (20th). 1986: 98-96-90 = 284 points (2nd). 1985: 90-80-91 = 294 points (1st). Bingo vom Spinnholt was the winner of the D.V. Meisterschaft in 1985 with 294 points, runner-up in 1986 with 284 points and placed third in 1988 with 290 points. His dams sister, Cora vom Papenkamp, was a three time winner of the D.V. 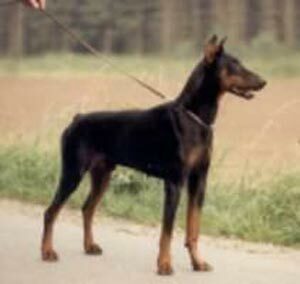 Meisterschaft whie his maternal grand-sire, Bingo von Ellendonk, was the winner of the D.V. Meisterschaft in 1977 and passed the Körung 'for life' with highest ratings for hardness, courage and working drives.